Origami Aerospace: Back into the Sky! (no, this is not a Colonial Viper). Back into the Sky! (no, this is not a Colonial Viper). Here's a new paper air rocket. I discovered there were plans for making paper model rockets - easily adapted to making an air rocket. (http://rocketry.wordpress.com/ultimate-paper-rocket-guide/). I adapted "Bob Harrington’s Satellite Interceptor" into a paper air rocket. The main trick for my rockets is knowing the width of paper around the pipe launcher is 3 inches in width. 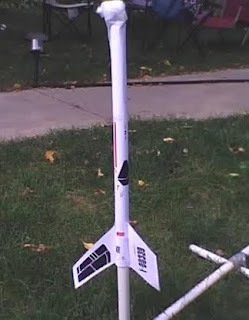 So I captured the main body image from the PDF, and printed it out with the dimensions 3x11 (stretching it a bit) - then I added an extender to the top - for future rockets, I'll overlap instead of taping together the extender for a better seal - I'll also add artwork to the that portion. I printed the fins to card stock and attached them, crimping a bit so the rocket will spin in flight for stability. This is a quick first attempt, and it worked well. A bit heavier than the magazine paper versions, it probably won't fly as high.... I only got one flight in because my air supply (a two liter pop bottle) broke after the first flight. Not too surprising since it was a couple years old and a veteran of many, many air rocket flights.